If you would like to improve the look or function of your nose, you may be considering a “nose job,” technically called rhinoplasty. 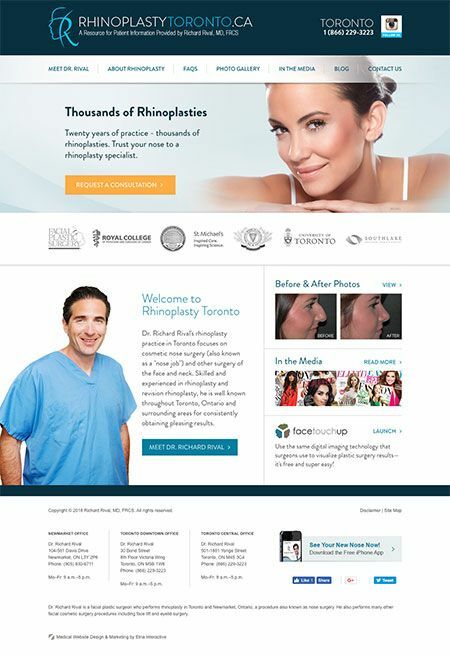 Women and men looking for the best rhinoplasty surgeon in Toronto usually choose Dr. Richard Rival, who’s earned that reputation because he creates natural-looking results that enhance facial balance and harmony without evidence of plastic surgery. 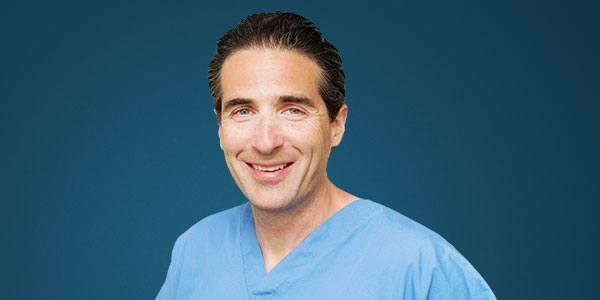 Dr. Rival is a facial plastic surgeon whose results are a testament to his experience and technique. Browse our photo gallery to see more of Dr. Rival’s actual patients. If you are in good health and want to improve the appearance of your nose, you may be a good candidate for rhinoplasty. Even though there is no upper age limit for having rhinoplasty, younger patients may be advised to wait until they are 14 or 15 (when the nose is fully developed) before undergoing the procedure. During your consultation, you will have the option of having Dr. Rival use computer imaging to create an approximation of your new look. The results can help you feel confident that you won’t end up with an obvious nose job. Our Toronto patients enjoy seeing how different changes to the nose will affect the overall appearance of the face. Board certifications: In Canada, most rhinoplasty surgeons are board-certified in either facial plastic surgery or otolaryngology (head and neck surgery). Rhinoplasty often involves both cosmetic and functional enhancements, so it’s ideal to choose a surgeon who has both certifications, such as Dr. Rival. Learn more about his credentials. Experience: Although board certification is important, it does not necessarily mean a surgeon has rhinoplasty experience; in fact, many board-certified surgeons have little or no actual experience performing rhinoplasty. Be sure to choose a surgeon who has performed a significant number of rhinoplasty procedures for a variety of concerns and continues to regularly perform the procedure. Results: Surgeons who have extensive rhinoplasty experience will have a sizable portfolio of before-and-after patient photos taken from multiple angles, not just the profile. By looking at these photos, you can see the actual improvements made by the surgeon and how he or she addressed various concerns. Patient recommendations: When friends or family members have attractive results and positive interactions with a surgeon, it’s likely your experience will be similar. Internet reviews can provide helpful information, as well. Visit Dr. Rival’s Choosing a Plastic Surgeon page to learn about other issues to consider. Dr. Rival focuses exclusively on facial plastic surgery, bringing a specialist's unmatched technical skill and sense of aesthetics to each procedure. Dr. Rival examines your nose externally and assesses its size, shape, and skin quality. It’s important to consider whether your nose is in proportion with the rest of your face, as well as your height, body type, and gender. Sometimes, he might suggest chin augmentation, either along with or instead of rhinoplasty, to help you achieve a more pleasing facial balance. Dr. Rival also examines the internal structures of your nose to assess whether you can breathe properly. This is especially important if you are consulting with Dr. Rival about revision rhinoplasty. Being a board-certified otolaryngologist, he has specialized knowledge of the internal structures of the nose. He has extensive experience performing functional nose surgery as well as making cosmetic enhancements for his rhinoplasty patients. After Dr. Rival thoroughly examines your nose, he asks you to describe what you’d like to change about it. Computer imaging can help you see potential results. This technology is a valuable tool that helps Dr. Rival clearly understand your aesthetic goals. Once you’ve decided to have nose surgery, Dr. Rival’s staff reviews the fees, helps you determine any medical coverage, and goes over the recovery process. Dr. Rival begins the procedure by elevating the skin of the nose, exposing the underlying bone and cartilaginous framework. He then re-shapes these structures to achieve the desired result. The skin and soft tissues re-position themselves over the new form of the nose. Dr. Rival has experience with both approaches, and one isn’t necessarily better than the other. An open procedure is usually used for more extensive changes to the nose. He chooses the surgical approach that is best suited to the desired improvements. If the base of the nose needs to be narrowed or the nostrils reduced, he will remove small pieces of skin below the nostrils. Because he is a rhinoplasty specialist, Dr. Rival maintains a specialty website all about the rhinoplasty procedure. Visit www.rhinoplastytoronto.ca for more detailed information on nose surgery. In some cases, Dr. Rival corrects breathing problems related to the internal nasal structures at the same time as nose reshaping. As a board-certified otolaryngologist (head-and-neck surgeon), Dr. Rival has the training and experience to perform this specialized nose surgery. For Ontario residents, this portion of the rhinoplasty surgery may be covered by the Ministry of Health. It is quite common to combine functional and cosmetic nose surgery. Revision rhinoplasty, also called secondary rhinoplasty, is a surgical procedure that corrects unsatisfactory results from previous nose surgery. An initial rhinoplasty procedure requires specialized skills, but revision rhinoplasty involves complications that make the procedure even more challenging to perform. Although Dr. Rival encourages past rhinoplasty patients to meet with him as soon as they are ready to discuss their concerns, he recommends waiting about a year after the previous rhinoplasty to undergo corrective surgery. That ensures the nose has fully healed and that swelling has subsided completely. Our patients find it helpful to get an idea of what to expect during their recovery. Using this information, you can prepare and schedule time off from work, school, or other obligations. Most patients experience only minimal discomfort after nose surgery. Dr. Rival typically uses a nasal splint to protect the patient’s nose and help maintain its shape. He rarely uses nasal packing, which most patients find uncomfortable. Instead, he uses advanced surgical techniques to control initial bleeding, making nasal packing unnecessary. He removes the splint and stitches within 5 to 7 days. Most patients have some bruising and swelling around their eyes and their noses that increases for the first 2 to 3 days after surgery and then gradually fades. To prevent bruising, some patients take the herbal supplement arnica montana. You can use camouflage makeup to conceal bruising after 5 days. At the end of the first week, it’s likely that you will feel well enough to go out in public. While bruising usually disappears within 2 weeks, swelling can take longer to resolve. Most patients return to work within 1 to 2 weeks, although the timeline depends on your occupation. Expect to resume most types of exercise after 2 weeks. Avoid sports or activities that involve facial injury risks for at least 6 weeks after surgery. Wear sunscreen consistently for several months, as the skin is likely to be especially sensitive while it heals. Your nose’s appearance will gradually improve for several months as the swelling continues to diminish. Even though you’ll notice some improvements within the first week of surgery, the nose’s appearance will continue changing slightly for 6 months to 2 years. Most patients are amazed at how changes to this one feature can improve their appearance and enhance their self-confidence. If you’ve been thinking about rhinoplasty, few plastic surgeons can match the experience or training of Dr. Rival. You can request a consultation using the online form to meet personally with Dr. Rival, or call us toll-free at (866) 229-3223. Rhinoplasty is a complex procedure, and it requires both technical skill and an artistic vision. Your safety and outcome depend on the training and experience of your surgeon. When choosing a surgeon for your rhinoplasty, cost should be a secondary factor. Does medical insurance or the Ministry of Health (OHIP) cover rhinoplasty? Nose surgery that improves breathing (septoplasty, turbinate reduction) is generally covered by your provincial insurance. This is billed directly to the government by your surgeon. The fee quoted to you is for the cosmetic portion of the surgery (rhinoplasty). Nasal deformity as a result of recent trauma or congenital anomaly may sometimes be covered by your provincial insurance. Pre-approval by your provincial insurance is usually required. Nonsurgical rhinoplasty reshapes the nose temporarily using injectable fillers such as Restylane®, JUVÉDERM® or RADIESSE® to build up specific areas. This technique provides minor correction for very specific concerns. Because the body gradually absorbs fillers, improvements created by nonsurgical rhinoplasty can diminish unevenly. Dr. Rival recommends surgical rhinoplasty performed by an experienced, qualified physician for more precise results that last indefinitely. Nose surgery is very safe but, as with any surgery, there are some risks. The most common complications are infection, excessive bleeding, or a bad reaction to anesthesia. These are extremely rare, but Dr. Rival encourages patients to contact him and his medical team at any time with questions or concerns. There is also the risk that patients may be unhappy with their results. Dr. Rival specializes in rhinoplasty and often performs revision rhinoplasty cases for patients who aren’t satisfied with the results of rhinoplasty performed by other surgeons.